Photo - New York Historical Society, New York. Wallace Bros. (before 1888). Creamer, sugar bowl, and spoon holder. Silver or silver plate. (Object nos. 1998:41:1A-C. Viewed 16 July 2018. G02826-28). Mohave Museum of History and Arts, Kingman, Arizona: creamer; sugar bowl; spoon holder. R. Wallace & Sons Manufacturing Co. (c. 1890). Bowl, Carmel pattern. Sterling silver. (Accession no. G2012.40.500. Viewed 17 August 2018. L00565-01). Offline - Mobile Museum of Art, Alabama. R. Wallace & Sons. (c. 1909). Candy dish. Silver or silver plate. (Cat. no. 92.0004.0012. Viewed 16 July 2018. G02837). R. Wallace & Sons. (c. 1910). Bowl, Antlers Hotel. Silver or silver plate. (Cat. no. 994.0038.0001. Viewed 16 July 2018. G02838). Wallace Silversmiths. (1910). Footed shell dish. Sterling silver. (Accession no. G2012.40.529. Viewed 17 August 2018. L00565-05). Wallace Silversmiths. (1910). Shell dish. Sterling silver. (Accession no. G2012.40.535. Viewed 17 August 2018. L00565-06). Wallace Bros. (c. 1912). Loving cup, trophy. Silver or silver plate. (Cat. no. 1964.20.1. Viewed 16 July 2018. G02796-97). Photo - Woodstock Museum, Woodstock, Ontario, Canada. Wallace Bros. (c. 1912). Loving cup, trophy. Silver plate. (Cat. no. 1963.13.1. Viewed 16 July 2018. G02800-01). Photos - Georgia Historical Society, Savannah (sugar bowl; cream pitcher). R. Wallace & Sons. (c. 1919). Bowl, Antlers Hotel. Silver or silver plate. (Cat. no. 998.0155.0001. Viewed 16 July 2018. G02839). Photo - Colorado Springs Pioneers Museum, CO.
Wallace Bros. Silver Company. (c. 1919). Tea service: teapot, creamer, sugar bowl. Silver plate. [Cat. ID no. 2006.171.1(-.3). Viewed 11 August 2018. L00026]. Presumably R. Wallace & Sons Manufacturing Co. (c. 1920). Oval dish. Sterling silver. (Object ID no. PM.80.45.177. Viewed 3 August 2018. H00217-18). R. Wallace & Sons Manufacturing Co. (c. 1920). Covered basket. Silver or silver plate. (Accession no. 1984.63a-b. Viewed 26 August 2018. J00142). Photo - McCord Museum, Montréal / New Brunswick Museum, Canada. R. Wallace & Sons Mfg. Co. (1924). Vegetable dish, for Rock Island Lines. Silver plate. (Accession nos. S.1991.1.355. Viewed 31 July 2018. H00131-32). Wallace Bros. (c. 1924). Loving cup, trophy. Silver or silver plate. (Cat. no. 1963.15.1. Viewed 16 July 2018. G02798-99). R. Wallace & Sons Manufacturing Company. (c. 1925). Small tray, La Fayette Hotel. Silver or silver plate. (Cat. no. 2001.7.2. Viewed 2 August 2018. H00186). Photo - Kentucky Historical Society, Frankfort. Wallace Bros. (1925-40). Loving cup, trophy. Silver plate. (Cat. no. 0985.04.00112. Viewed 14 July 2018. G02725). American Civil War Museum, Richmond & Appomattox, VA.
Wallace Bros. (c. 1926). Loving cup, trophy. Silver or silver plate. (Cat. no. 1963.16.1. Viewed 16 July 2018. G02802-03). Wallace Bros. Silver Co. (c. 1926). Trophy. Silver or silver plate. (Cat. ID no. 2012.22.1. Viewed 11 August 2018. L00024). Wallace Bros. (c. 1927). Plaque. Silver or silver plate. (Object no. 2004.090.0202. Viewed 16 July 2018. G02844-45). Wallace Brothers Silver Co. (c. 1928). Cocktail shaker (rooster form), and four cocktail cups (with rooster forms). Silverplate and glass. [Accession nos. 2001.135.1.A-C; 2001.135.2(-5). Viewed 28 November 2018. J00231-35]. Photos - Dallas Museum of Art: cocktail cup 1; 2; 3; 4. Wallace Bros. (c. 1928). Trophy. Silver or silver plate. (Object no. 2004.090.0162. Viewed 16 July 2018. G02846-47). Photos - Dallas Museum of Art (coffeepot; teapot; creamer; sugar bowl; waste bowl; tray). Wallace Bros. Silver Co. (c. 1929). Trophy. Silver-plated pewter. (Object no. 2004.090.0157. Viewed 14 July 2018. G02697-98). Wallace Bros. (c. 1929). Trophy. Silver or silver plate. (Object no. 2004.090.0158. Viewed 16 July 2018. G02848-49). Wallace Bros. (c. 1929). Trophy. Silver or silver plate. (Cat. no. 64-66. Viewed 16 July 2018. G02833-34). Wallace Bros. Silver Company. (1929). Trophy. Silver plate. (Cat. no. UNNUMBERED-3823. Viewed 31 July 2018. H00140-41). Click the following link to see the parallel webpage - R. Wallace & Sons / Wallace Silversmiths design catalogues and historical documentation. Presumably R. Wallace & Sons Manufacturing Co. (c. 1930). Trophy. Silver plate. (Cat. no. "Unnumbered-3825". Viewed 4 August 2018. H00305-06). Presumably Wallace Silversmiths. (1930). Trophy. Silver plate. (Cat. no. Unnumbered-3828. Viewed 31 July 2018. H00142-43). Probably R. Wallace & Sons. (c. 1930). Trophy. Silver or silver plate. (Cat. ID no. 2007.52.69. Viewed 11 August 2018. L00027). R. Wallace & Sons Manufacturing Company. (1930-50). Platter, Hotel Fort Hayes. Silver plate. (Cat. no. H 99531. Viewed 2 August 2018. H00182-83). Photos - National Museum of American History, Smithsonian, Washington, DC (coffeepot; teapot; sugar bowl; creamer; oval tray). Probably R. Wallace & Sons Manufacturing Company. (1935). Cup, trophy. Silver. (Cat. no. 2003.49.12. Viewed 2 August 2018. H00187-88). Probably R. Wallace & Sons Manufacturing Company. (1935). Cup, trophy. Silver. (Cat. no. 2003.49.13. Viewed 2 August 2018. H00189-90). Offline - High Museum of Art, Atlanta. Wallace Bros. (c. 1936). Loving cup, trophy. Silver or silver plate. (Object no. 1972.030.001. Viewed 16 July 2018. G02816-17). Probably Wallace Silversmiths. (c. 1936). Trophy. Silver plate. Accession no. 1990.88.5. Viewed 26 July 2018. C00173). Presumably Wallace Silversmiths. (c. 1937). Loving cup, trophy. Silver or silver plate. (Cat. no. 1987.097.0001. Viewed 31 July 2018. H00136-37). Photo - Monroe County Historical Society, Bloomington, Indiana. Probably R. Wallace & Sons. (c. 1939). Trophy. Silver or silver plate. (Cat. ID no. 2012.45.3. Viewed 11 August 2018. L00023). Wallace Silversmiths. (c. 1949). Cup, brush and comb. Sterling silver. (Cat. no. M2015.2.25(-26). Viewed 2 August 2018. H00180-81). Photos - Howard County Historical Society, Ellicott City, Maryland: cup, brush and comb. Photo - Yale University Art Gallery, New Haven. Presumably Wallace Silversmiths. (c. 1964). Platter, trophy. Silver plate. (Cat. no. 2003.49.106. Viewed 4 August 2018. H00308). Presumably Wallace Silversmiths. (c. 1968). Trivet, trophy. Silver or silver plate. (Cat. no. 2013.70.6. Viewed 21 July 2018. E00080-81). Presumably Wallace Silversmiths. (1970). Bowl. (Accession no. 2013-15. Viewed 14 July 2018. G02711-12). Photo - Ashland University, University Archives, Ashland, Ohio. Presumably Wallace Silversmiths. (c. 1976). Commemorative bowl. Silver plate. (Cat. no. KM2012.9.21. Viewed 26 August 2018. J00129-30). Presumably Wallace Silversmiths. (c. 1977). Pitcher, trophy for Bill Shoemaker. Sterling silver. (Cat. no. 2008.004.0272. Viewed 14 July 2018. G02699-2700). Photo - Kentucky Derby Museum, Louisville, KY. Presumably R. Wallace & Sons. (1871-1960). Teapot. (Cat no. 2009.001.0015. Viewed 3 July 2018. G02142). Photo - Culinary Arts Museum, Johnson & Wales University, Providence, RI. Presumably R. Wallace & Sons. (1871-1961). Coffee pot. (Cat no. 2009.001.0024. Viewed 3 July 2018. G02143). Wallace Bros. (undated). Teapot. Silver plate. (Cat. no. 1995.12.13. Viewed 16 July 2018. G02806-07). Photo - History Museum of Western Virginia, Roanoke, VA. Presumably R. Wallace & Sons. (undated). Clothes brush. Sterling silver. (Object ID no. 1986.7.63. Viewed 16 July 2018. G02812-13). Wallace Silversmiths. (undated). Decorative bowl. Sterling silver. (Cat. no. 2015.22.4. Viewed 31 July 2018. H00138-39). Photo - Little Compton Historical Society, Little Compton, Rhode Island. Presumably R. Wallace & Sons Manufacturing Co. (undated). Round tray. Silver or silver plate. (Object ID no. 85.390.2238. Viewed 4 August 2018. H00304). Presumably Wallace Silversmiths. (undated). Pitcher. Silver or silver plate. (Accession no. 1996-186. Viewed 4 August 2018. H00302). Presumably Wallace Silversmiths. (undated). Round tray. Silver or silver plate. (Accession no. 1998-144. Viewed 4 August 2018. H00301). R. Wallace & Sons Manufacturing Co. (undated). Serving dish, lid and saucer. Silver or silver plate. (Cat. no. 2000.02.06 A-C. Viewed 25 August 2018. J00108-09). Photos - Montana Heritage Commission, Virginia City, Montana. Wallace Silversmiths. (1900-50). Tray. Silver or silver plate. (Cat. ID no. 2011.38.24. Viewed 11 August 2018. L00025). Wallace Bros. Silver Co. (undated). Hairbrush with floral design. Silver plate. (Cat. no. X1109. Viewed 23 August 2018. J00076). R. Wallace & Sons. (undated). Urn-shaped sugar bowl for Rueger Hotel, Richmond, VA. Silver plate. (Object no. 1993.217.A-B. Viewed 9 July 2018. G02426). Presumably Wallace Silversmiths. (undated). Candy dish. Silver or silver plate. (Object ID no. PM.80.45.251. Viewed 31 July 2018. H00144). Wallace Bros. Silver Co. (undated). Mug. Silver plate. (Object ID no. H.5862.36.A. Viewed 3 August 2018. H00219). R. Wallace & Sons. (1871). Twelve dessert spoons. Silver plate. (Accession nos. 87.007.1-12. Viewed 26 August 2018. J00127-28). Photo - Rosenberg Library, Galveston, Texas. Probably R. Wallace & Sons. (after 1871). Salad tongs. Silver or silver plate. (Accession no. 1971.310. Viewed 11 August 2018. L00022). R. Wallace & Sons. (1875). Teaspoon, Queen’s Royal Hotel. Silver or silver plate. (Object ID no. 993.542.251. Viewed 16 July 2018. G02820-21). Photos - Niagara Historical Society Museum, Niagara-on-the-Lake, Ontario, Canada. Presumably R. Wallace & Sons Manufacturing Co. (1875-79). Two forks. (Object ID no. 84.39.7(-8). Viewed 3 August 2018. H00212-13). R. Wallace & Sons Manufacturing Co. (1879). Six forks. [Accession nos. H.1969.95.11(-.16). Viewed 13 August 2018. L00350-55]. Wallace Bros. Silver Company. (1880-85). Butter knife. Silver plate. (Accession no. 1990.154.4. Viewed 2 August 2018. H00184). R. Wallace & Sons. (c. 1885). Dinner fork. Silver or silver plate. (Cat. no. 2016-004-021a. Viewed 17 July 2018. G02904-05). Presumably R. Wallace & Sons. (c. 1888). Butter knife. (Cat. no. P2002.11.018. Viewed 25 August 2018. J00123-24). R. Wallace & Sons Mfg. Co. (1890-1900). Forks (number unspecified). [Object ID no. H.6200.1201.A(-.B). Viewed 3 August 2018. H00215-16]. New York Historical Society, New York. R. Wallace & Sons Manufacturing Co. (c. 1892). Teaspoon. Sterling silver. (Cat. no. 91.93.281. Viewed 23 August 2018. J00075). R. Wallace & Sons. (c. 1895). Teaspoon, Waverly pattern. Sterling silver. Accession no. 1981.258.63. Viewed 26 July 2018. C00175). R. Wallace & Sons Mfg. Co. (1896). Berry spoon. Silver plate. (Object ID no. H.6200.1210. Viewed 3 August 2018. H00214). R. Wallace & Sons. (c. 1896). Four dessert spoons. Silver plate. (Object ID no. 1977.100.166. Viewed 16 July 2018. G02814-15). R. Wallace & Sons. (1896). Fork. Silver or silver plate. (Accession no. 1971.234. Viewed 11 August 2018. L00021). R. Wallace & Sons Manufacturing Company. (c. 1898). Coffee spoon, Astoria pattern. Silver plate. (Accession no. 1990.141.20. Viewed 2 August 2018. H00185). R. Wallace & Sons. (c. 1899). Teaspoon, Waverly pattern. Sterling silver. Accession no. 1981.258.61. Viewed 26 July 2018. C00174). Wallace Bros. (c. 1900; late 19th / early 20th century). Sugar tongs. Silver plate. (Accession no. 1961.326. Viewed 16 July 2018. G02808-10). Photos - Nichols House Museum, Boston, MA. R. Wallace & Sons. (c. 1901). Fork. Sterling silver. (Cat. no. 88.32.33. Viewed 18 July 2018. G02952-53). Photo - Minnetrista cultural center, Muncie, Indiana. R. Wallace & Sons. (c. 1902). Twelve dessert spoons. Silver plate. (Accession no. 84.007.1-12. Viewed 26 August 2018. J00125-26). R. Wallace & Sons Manufacturing Co. (patented 1902). Dinner fork and teaspoon. Silver or silver plate. (Accession no. 1985.11. Viewed 4 August 2018. H00307). R. Wallace & Sons Manufacturing Co. (1912). Pie server, Carmel pattern. Sterling silver. (Accession no. G2012.40.607. Viewed 17 August 2018. L00565-02). Probably R. Wallace & Sons Manufacturing Co. (patented 1914). Spoon. Silver or silver plate. (Call no. R 2206. Viewed 11 August 2018. L00032). Presumably R. Wallace & Sons Manufacturing Co. (1917). Souvenir spoon, featuring Fort Smith, Arkansas. Sterling silver. (Object no. 2006.007.01. Viewed 4 August 2018. H00303). Photos - Dallas Museum of Art (knife; fork; salad fork; spoon). Possibly R. Wallace & Sons Manufacturing Co. (c. 1918). U. S. Army fork. (Call no. REALIA 03561. Viewed 11 August 2018. L00031). Photo - Pritzker Military Museum & Library, Chicago. R. Wallace & Sons. (c. 1924). Dinner knife, Antlers Hotel. Silver plate. (Cat. no. 92.0004.0016. Viewed 16 July 2018. G02829). Wallace Silversmiths. (c. 1925). Dinner fork. (Cat. no. 1971.213.009. Viewed 14 June 2018. G02723-24). Photo - San Mateo County History Museum, Redwood City, California. R. Wallace & Sons. (c. 1925). Dinner fork, Antlers Hotel. Silver plate. (Cat. no. 92.0004.0013. Viewed 16 July 2018. G02830). R. Wallace & Sons. (c. 1928). Dessert spoon, Antlers Hotel. Silver plate. (Cat. no. 92.0004.0014. Viewed 16 July 2018. G02831). R. Wallace & Sons. (c. 1928). Tablespoon, Antlers Hotel. Silver or silver plate. (Cat. no. 80-54-9. Viewed 16 July 2018. G02836). Probably R. Wallace & Sons. (c. 1930). Dessert spoon, Antlers Hotel. Silver plate. (Cat. no. 92.0004.0015. Viewed 16 July 2018. G02832). R. Wallace & Sons. Spoon. Sterling silver. (Cat. no. 2005.018.0125. Viewed 14 July 2018. G02695-96). Photos - Benicia Historical Museum, Benicia, California. Wallace Brothers Silver Co. (designed 1939). 1939 New York World’s Fair spoon. Silver plate. (Accession no. 2005.25.2. Viewed 28 November 2018. J00236). Wolfsonian FIU, Miami Beach, FL. R. Wallace & Sons Manufacturing Co. (1930s). Fork. Sterling silver. (Object ID no. 89.313.140. Viewed 3 August 2018. H00220). R. Wallace & Sons Manufacturing Co. (1944-53). Iced tea spoon. Sterling silver. [Cat. no. 2004.0137.001(-.003). Viewed 11 August 2018. L00028-30]. Photos - Rosenbach Museum & Library, Philadelphia, PA: iced tea spoon 1, 2, 3. Wallace Silversmiths. (undated). Soup spoons. Silver or silver plate. (Accession no. MH 1997.14.138. Viewed 6 July 2018. G02356-57). R. Wallace & Sons. (undated). Sugar tongs. (Cat. no. 1970.9.10. Viewed 6 July 2018. G02353-54). Photo - Guelph Museums, Guelph, Ontario, Canada. R. Wallace & Sons. (undated). Butter knife. (Part of cat. no. 2015.49.2a-c. Viewed 16 July 2018. G02804-05). Photo - Museum of American Glass in West Virginia, Weston. Wallace Bros. (undated). Dinner fork. Silver plate. (Object ID no. 1987.045.119. Viewed 16 July 2018. G02818-19). R. Wallace & Sons. (undated). Knife. Silver plate. (Object ID no. 2007.007.006. Viewed 16 July 2018. G02822-23). R. Wallace & Sons. (undated). Spoon, Queen’s Royal Hotel. Silver or silver plate. (Object ID no. 2008.025.001. Viewed 16 July 2018. G02824-25). R. Wallace & Sons. (undated). Two teaspoons. Silver or silver plate. (Cat. no. 999.0206.0041a,b. Viewed 16 July 2018. G02841-42). Presumably R. Wallace & Sons. (undated). Spoon. Silver or silver plate. (Cat. no. 2004.11.07.jh. Viewed 16 July 2018. G02874-75). R. Wallace & Sons. (undated). Two spoons. Silver plate and nickel plate. (Object ID no. 1982.107.2192. Viewed 16 July 2018. G02897-98). Presumably R. Wallace & Sons. (undated). Marmalade spoon. (Identifier: NM.0507234. Viewed 31 July 2018. H00130). Photo - Nordiska museet, Stockholm, Sweden. Presumably R. Wallace & Sons. (undated). Set of eleven teaspoons. (Cat. no. P2002.02.10A-K. Viewed 25 August 2018. J00121-22). Presumably Wallace Silversmiths. (undated). Sugar spoon. Sterling silver. (Cat. no. PHM2012.01.1368a-b. Viewed 26 August 2018. J00131-32). Photo - Pope House Museum, City of Raleigh, North Carolina. R. Wallace & Sons Manufacturing Co. (undated). Two knives. Silver plate. (Object ID no. 71.35.3.A(-.B). Viewed 3 August 2018. H00210-11). Presumably R. Wallace & Sons. (undated). Baby fork. Sterling silver. (Cat. no. 70-135. Viewed 16 July 2018. G02835). R. Wallace & Sons. (undated). Souvenir spoon. Sterling silver. (Viewed 21 July 2018. E00078). R. Wallace & Sons. (undated). Baby spoon. Silver or silver plate. (Cat. no. 82.111.2. Viewed 21 July 2018. E00079). R. Wallace & Sons. (undated). Souvenir spoon, view of Monson Academy. Silver or silver plate. (Accession no. HD 89.062. Viewed 6 July 2018. G02355). R. Wallace & Sons. (undated). Twelve fish knives. (Accession nos. 1983.41.51.01 - .012. Viewed 16 July 2018. G02811). R. Wallace & Sons. (undated). Four serving spoons. Silver or silver plate. (Cat. no. 999.0206.0049a-d. Viewed 16 July 2018. G02843). R. Wallace & Sons. (undated). Dinner fork. Silver or silver plate. (Cat. no. 999.0206.0040a-f. Viewed 16 July 2018. G02840). Photo - Bonhams London - Silver and Objects of Vertu including Flatware (16 APR 2014). Photo - Christie’s New York - Living with art (29-30 MAR 2016). Photo - Christie’s New York - Christie’s Interiors (9-10 FEB 2009). Photo - Bonhams San Francisco - Art + Decor including Jewellery (28-29 SEP 2015). Photo - Christie’s New York - Two Distinguished American Collections: The Estate of the Hon. Noreen Drexel, Newport, R.I., The Estate of Van Cliburn, Fort Worth, TX (4-5 MAR 2014). Photo - Christie’s New York - Christie’s Interiors (24-25 JUN 2010). Photo - Bonhams Los Angeles - Period art and design (9-10 NOV 2014). R. Wallace & Sons. (c. 1900; late 19th / early 20th century). Two bowls with decorated borders. (Viewed 2 July 2018. G02116). Photo - Christie’s New York - Interiors (11-12 December 2013). Photo - Christie’s London - Selected silver and plate (1 DEC 2004). Photo - Bonhams Los Angeles - Period Art and Design including Jewellery (19 MAY 2014). Photo - Bonhams London - British and Continental Silver including Objects of Vertu (30 JUL 2014). Photo - Christie’s New York - The Wayne LaPoe Collection of Oceanliner Memorabilia and Art (16 JUN 2004). Photo - Bonhams San Francisco - Art + Decor (22 MAR 2015). Photo - Christie’s New York - Interiors (23-24 JUN 2015). Photo - Bonhams San Francisco - Period Art & Design (24 AUG 2014). Photo - Bonhams San Francisco - Period Art & Design (29 SEP 2013). 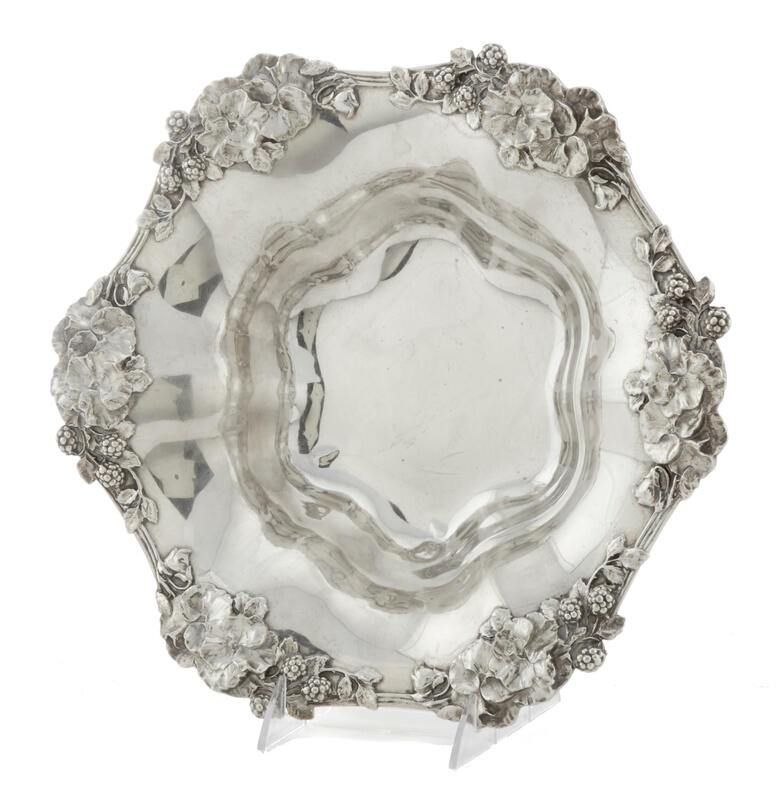 Photo - Christie’s London - Silver and plate (12 DEC 2006). Photo - Christie’s New York - The house sale (1-3 OCT 2007). Photo - Bonhams Edinburgh - Jewellery & Silver (8 JUN 2011). Photo - Bonhams London - British and Continental Silver including Objects of Vertu (9 DEC 2015). > State Spoons exhibited by R. Wallace & Sons Mfg. Co.
For documentation, see the Design Meriden - R. Wallace & Sons design catalogues and historical information webpage. > Unspecified designs exhibited by R. Wallace & Sons Mfg. Co.
4 venues: 1930-31. International exhibition of contemporary metalwork and cotton textiles, organized by the American Federation of Arts, Washington, DC. Exhibition listing Art Institute of Chicago. Online - exhibition catalogue - Metropolitan Museum of Art. For documentation, see the Design Meriden - R. Wallace & Sons Mfg. Co. design catalogues and historical documentation page. Exhibition catalogue - Courtesy University of Wisconsin, Madison. 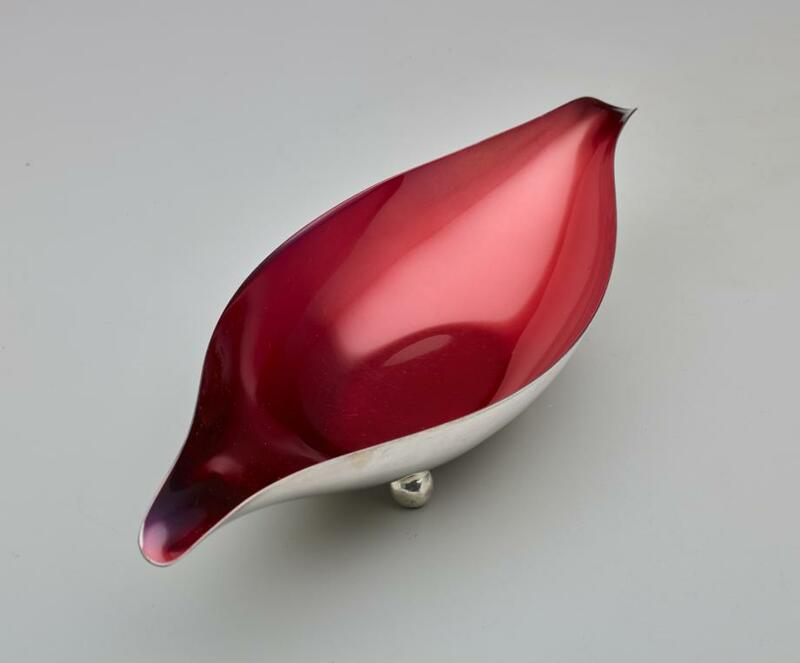 Online - exhibition catalogue - American Craft Council, Minneapolis, MN. For documentation, see the Design Meriden - Wallace Brothers Silver Co. design catalogues and historical information webpage. 5 February 1994 - 13 March 1995. Back in style: Selections from the McFaddin-Ward House Reserve Collection at Art Museum of Southeast Texas, Beaumont. The Wallace rooster cocktail shaker was featured extensively in Dallas area media coverage. May 2017 - ongoing. Style and status in sterling: American silver at Newark Museum, Newark, New Jersey. Wallace silver - 1: designs in collections, etc. | 2: design catalogues, etc.